As the curtain rose on Tent Theatre’s production of 42nd Street, there was a moment of serendipity. Twenty-five years ago, during Tent’s silver anniversary season, the musical A Day in Hollywood/A Night in the Ukraine featured a curtain partially risen thus highlighting the feet of the dancers. A similar moment occurs in the opening of 42nd Street. A quarter of a century and 74 shows may have separated the two productions, but through this the past was connected to the present. Once the curtain rose completely, the electricity was palpable. The audience of Tent alumni greeted the dancers with thunderous applause which was met by electric tapping on stage. It is impossible to say which group was having more fun or was more appreciative of the other. The love was flowing between actors and audience even more than it normally does – it was a moment that was, well, truly golden. To be honest, 42nd Street is very weak in the plot department. In order to truly enjoy it, one must not have time to dwell on the libretto. Director Michael Casey kept the show moving at a brisk pace without making it seem rushed. Under his direction, the cast emphasized the humor in the plot while not overplaying the melodrama or the corniness. This is not an easy task to accomplish, but Casey and company achieved it. Casey also deserves much credit for superbly casting the production. As chorine Peggy Sawyer, Katie Wesler mixes the air of naïveté with outstanding singing and dancing. It is easy to be cloying or annoying in this part, but Miss Wesler’s portrayal shows the audience why everyone (well almost everyone) in the show likes Peggy. The diva who doesn’t like Peggy, the tempestuous Dorothy Brock, is played with full zest by Sabra Sellers. She is obviously relishing chewing scenery but also works in moments of vulnerability throughout the evening. It is not easy to make a caricature into a character, but Miss Sellers achieves it. Mr. Fike and Miss Sellers play the characters a bit younger than they are often portrayed. This works very well by making the interaction between each of these two and other leading characters much more believable. For instance, the thought of Sawyer stepping into Brock’s role or potential romantic sparks between Marsh and Sawyer is much more likely due to their ages being more closely aligned. The character of Billy Lawlor has little to do but sing and dance. Christopher Lengrich effortlessly combined the two to create a charming leading man who was a combination of Rudy Vallee and Fred Astaire. His singing alternated between brassy and clear depending on the mood while his dancing was both relaxed and elegant. Julia Mackenzie and Carl Glenn played the writers of the show within the show. They each mined their moments for all they were worth with warm, winning portrayals. They were clearly enjoying themselves as they sang and danced. Their characters are often saddled with the most leaden dialogue in the libretto but they managed to breathe life into the lines. Tent veteran Ron Seney stole his scenes as a wealthy industrialist. His “sugar daddy” was lovable. From his waddle in cowboy boots to the cigarette holder he was constantly chewing, Seney created laughs just by being on stage. Though he had little to do except be charming, Mitch Brauer, played Seney’s rival for the hand of Miss Sellers. In the few lines of dialogue afforded him by the libretto, he did achieve chemistry with her. 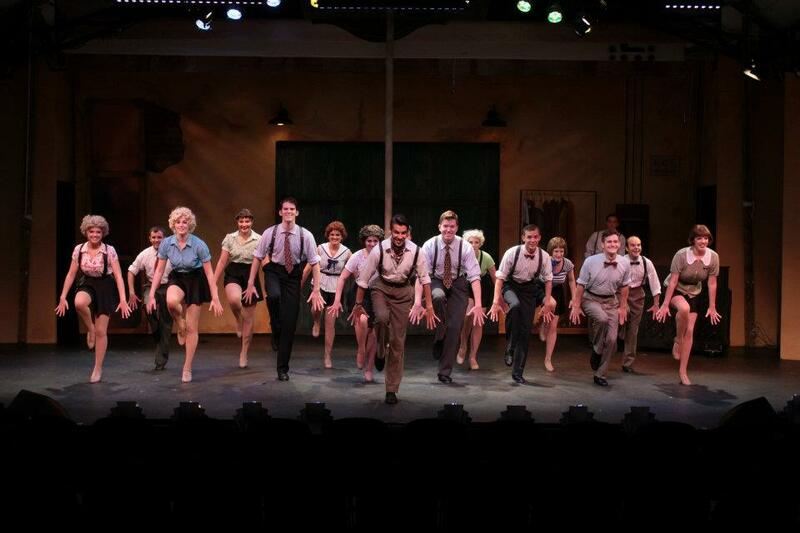 42nd Street is ultimately a dance show. Portraying the choreographer of the show within the show, Colin Shea Denniston was front and center during many of the dance numbers. He makes intricate steps seem deceptively easy. Jessica Ryan’s choreography was both nostalgic and inventive. In a tap show, it is easy to be repetitive, but each number was distinct. While the Tent stage is larger than it once was, it is still much more limited than a typical stage. As a choreographer in Tent, Miss Ryan cannot rely on a lot of props or furniture to make the dances seem unique. Instead she uses pretty much every conceivable step in the tap canon and mixes it up with a variety of combinations of dancers. She (and Mr. Denniston as dance captain) obviously put the dancers through their paces because the steps were executed with precision. The hollow Tent stage is unforgiving to sloppy tapping. The resulting echoes can create a cacophony which is deafening. Not only did the 42nd Street dancers perform the numbers well, they were honestly having fun doing so. The smiles they displayed were genuine – these were not fake smiles plastered on, they were smiles of enjoyment as the dancers entertained the audience. Each of the dancers in the chorus had a moment to shine in the evening. They were individual characters not just a pair of tap shoes. As “Anytime Annie” Janell Rinne was the wisecracking chorine with the heart of gold. Other chorus girls were played by Sarah McGowan, Emily Wicks, Natalie Rae Baughman, Kara Schoenhofer, Molly Rosenthal, Camille Hendricks and Lizzie Klemm. Matching them step for step were Andy Frank, Josh Inmon, Anthony Christopher Milfelt, Richard F. Nebel II, Nick Rishel, Evan Wallace Robison and Tommy Wallace. The excellence of the production was aided by the physical design. Chris DePriest combined 1930’s style canvas drops and flats with set pieces which were moved off and on with dexterity by the show’s running crew. In the small space he was provided, DePriest still managed to create layers of playing spaces much like a 1930s musical would have had. Michael Foster’s lighting design captured the various moods of the numbers as well as distinguishing between on-stage and moments in the wings. His lighting in the “Shadow Waltz” number could serve as a primer for audience members to understand the role lights can play in creating theatre. Mark Putman’s sound design ensured that everyone was heard whether it was a quiet moment between two people or a large production number, which is not an easy task at all. Under the musical direction of Heather Chittenden-Luellen, the orchestra supported the singers without overpowering them. Likewise, she helped the singers capture the various styles of singing of the era. 42nd Street won the Tony for Best Musical in 1981. That same year Tent co-founder Irene Coger directed her final Tent production, Dames at Sea. Both shows revel in show business clichés and plenty of tap dancing. I do not know if she ever envisioned 42nd Street in Tent, but I think she would have been pleased by the production. She certainly would have been pleased by the fact that the singers and dancers were both working hard and having fun (two attributes she valued and believed were not mutually exclusive).